← Recipe – Shea & cacao butter melts; almost good enough to eat! Great afternoon fun! A green tea tasting party with friends. But which would be the winning blend? This all started because my work colleague had been raving about matcha. We then started to notice how many different brands of green tea were around us and before we knew it we were getting creative and planning a green tea tasting party. We used eight different brands and made written notes on each, before sharing our findings at the end. Inhaling the aromas we racked our brains for visions of what each scent brought to mind; wet straw in the countryside or jasmine flowers mixed with bonfire smoke. 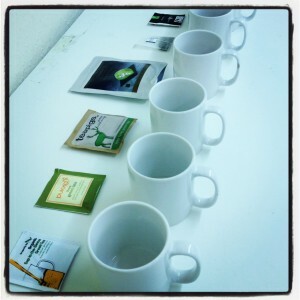 We tasted the flavours, holding the hot liquid in our mouths to discover if it was bitter, earthy or floral. Some felt astringent or left a tingling sensation on the tongue and others seemed more like they created a sense of expansion in the mouth. Most were watery in texture but we were all surprised to find one that was much heavier and even, dare we say, creamy. Really there is a whole world of sensation to discover in a mug of tea! 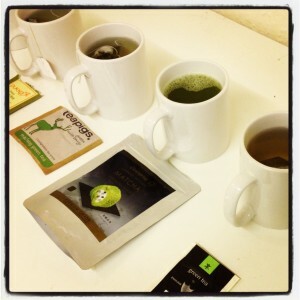 The matcha possibly should have been in a different category, being a powder rather than a tea bag, but we made allowances, and did even think it would be our favourite green tea….. or at least my colleague’s. 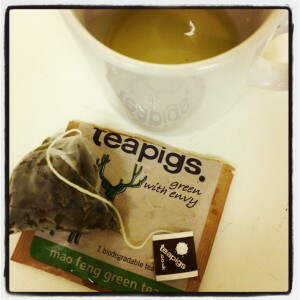 But the overall winner was by far Tea Pigs with their ‘Green with Envy’ brand. 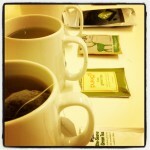 I wonder if that is how any of the other little green tea bags were feeling at the end of this competition? Definitely a fun way to spend some time with friends. I really recommend it. This entry was posted in Front Page, Uncategorized and tagged Community spirit, Drinks. Bookmark the permalink.